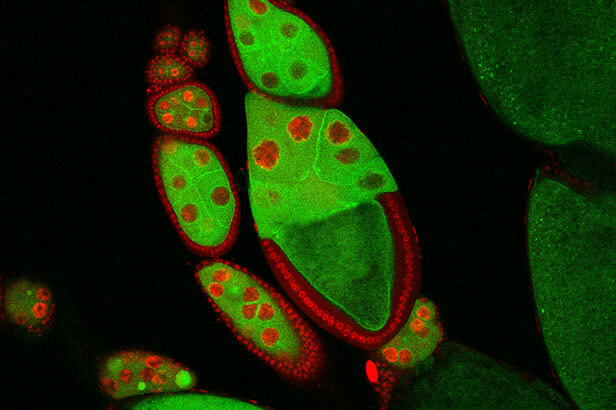 The Ohio State University Department of Molecular Genetics is comprised of a diverse group of researchers and faculty that utilize genetics, genomics, molecular biology and model organisms to address fundamental issues in 21st century biology. We have a significant opportunity here to increase the scientific literacy and competency of our students and to reach out and attract and nurture the next generations of scientists. Undergraduate research is highly encouraged; students are matched with faculty mentors. Molecular geneticist Susan Cole and biochemist Jane Jackman co-direct the National Science Foundation’s 10-week summer program, Research Experience for Undergraduates (REU), partnering with biochemistry. REU is an opportunity for science majors from smaller institutions to do intellectually demanding research in leading-edge labs, giving them better preparation for graduate or professional school. In 2000, Professor Amanda Simcox and her undergraduate students field-tested an idea to get high school biology students interested and excited about science. The DNA Fingerprinting Workshops consist of two components: first, a session that gives the students hands-on-experience with state-of-the-art equipment and molecular-biology techniques. The second part involves setting up a crime scene scenario that students can solve using the DNA fingerprinting techniques they have learned. Undergraduate students take a class with Simcox and learn how to go into the schools to mentor and teach the high school students. This service learning experience is still going strong after 17 years and now under the direction of Professor Amanda Bird. Annual Falkenthal Spring Symposium: A departmental event that showcases graduate student research presentations. In addition, an alumnus/ alumna is invited each year to be the keynote speaker at this event, connecting our past with the future. Anita Hopper’s work on tRNAs in yeast reveal previously unappreciated complexities about this fundamental molecule essential for gene expression. Stephen Osmani's research on how the cell cycle is regulated during mitosis should provide insights about how cancer develops and can be treated. Wayne Miles studies how RNA-binding proteins modulate the transcriptome and proteome in cancerous cells. Dave Somers’s research on molecular mechanisms of the circadian clock in plants has implications for crop production as well as human health. Christin Burd’s lab is working on mouse models of melanoma. The Bisaro, Hollick, and Slotkin labs all study various aspects of epigenetic gene regulation with profound implications for human disease and crop production.